The Wakayamas -- Sarah, left, Connor, 15, Kyle, 16, and Mark -- are each artistic in their own way. The blue stool was made by Connor and is topped with a map decoupage. They're an everyday family living in a normal house, but in a wasteful society Sarah and Mark Wakayama, along with sons Kyle and Connor, stand apart from the norm in their approach to sprucing up their home. "I like to recycle and reuse," said Sarah Wakayama, "In Hawaii, especially (with its high cost of living), we have to." With the current push toward "greening" for a better world, they've become trendy in that regard. But it's a philosophy Sarah and Mark have always practiced, reinforced by former neighbor Chris Reiner, an established artist and sometime furniture designer who uses castaway items to fuel his creativity. Reiner's art was featured in the Contemporary Museum's 2005 "Biennial of Hawaii Artists." "He and his wife lived right next door, and the boys would hang out with him," said Wakayama. "He'd call us whenever he saw something he thought we'd like and say, 'Hey, there's a great lounge chair on the street here. I think you should check it out before someone else takes it.'" 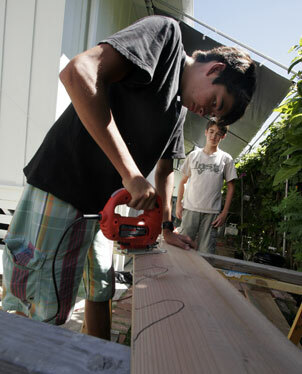 Kyle works on a skateboard rack using leftover wood from the home renovation. "The mirror in the living room, we got that idea from him," Mark Wakayama said. "We took one of the old window casings and refinished and painted it, and used it to frame a mirror." When Reiner moved he left behind one of his pieces, "Night Light," a frosted glass French window that emits a soft glow, which Connor uses in his room. He also left with them motivation to continue recycling efforts that might involve friends and family -- sometimes with playful results. The Wayakamas have collected tiny pieces of beach glass during the years in lovely blue, green and amber hues, which are stored in a huge, clear plastic sack, until the creative mood strikes, sometimes when guests are over. It's then that the bag is hauled out and the pieces hot-glued onto Styrofoam wreath forms. Not for Christmas, not for any particular reason other than camaraderie. It's a social event, fashioning wreaths on the front porch as the sun goes down, the adults sipping wine and the kids, soda. Unfinished wreaths are put away until next time. Once done, each person takes his completed wreath as a memento -- and perhaps as inspiration to continue the link in the recycling chain. Kyle's masterpiece is completed and kept in his bedroom. A mom, a dad, a couple of kids and a dog. 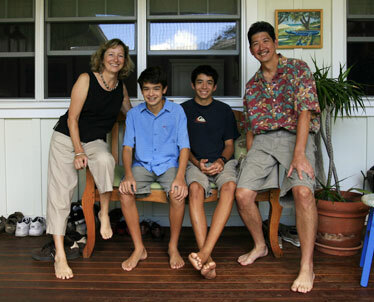 Sounds like your typical everyday family -- "nothing out of the ordinary," as matriarch Sarah Wakayama put it. They might not be "The Sopranos" or the "Everybody Loves Raymond" Romanos. But what the Wakayamas have managed to do with their everyday, normal lives is transform ordinary items into creative, decorative pieces for a cozy space, not an easy feat with Sarah and husband Mark both working full time for United Airlines juggling odd schedules. The plantation-style, board-and-batten house, built on a 4,900-sq. foot lot in 1929, is tucked away on a small side street in Manoa and was a 1,050-sq foot, two-bedroom, one-bath fixer-upper when they bought it six years ago. Two more bedrooms and a couple of baths later, it is as humble as are Sarah and Mark about their family of four and the canvas upon which each does his part to create a warm and colorful portrait of a "home sweet home." Mark had a hand in most of the structural renovation and laid the wooden floor with the help of a handy friend. An ocean-blue stool topped with a map decoupage was a school project of son Connor, 15, and sits on the front porch. Elder son Kyle, 16, has just made the first cuts on a slab of wood for a skateboard rack he's building with plans he found on the Internet. Sarah pieced together a clay tile mosaic to form the address numbers on a slab hung by the front door. She also gave the old front French doors new life as bedroom doors with shoji paper replacing the glass. ("It creates privacy but still allows the light to come in.") The mailbox, black with bright, hand-painted orange flowers, was a present. "Most everything you see here has meaning to us. They were either made by us or people we know, or if not, they were gifts from friends." She prefers it that way, over the sterile qualities of a contrively furnished home. If not handmade or gifts, the furnishings are recycled, like the chairs that greet visitors who approach the porch from the front lawn. Aluminum framed with sea-foam green lattice, they recall lazy summer days sipping ice tea, and were in good condition when rescued from the roadside, destined for a landfill. The Wakayama boys have total control over the decor in their bedrooms. Kyle, left, chose to give his room a Rasta theme with walls painted red, green and yellow. Connor painted his bedroom walls blue. Metal lockers were also a find, scooped from an office equipment sale at United Airlines and painted vibrant red and orange for Connor and Kyle to use as storage. Another score? "We took in the Historic Manoa houses tour and learned that most of the old houses here had Douglas fir floors," said Mark, who ripped out the existing linoleum that had blanketed them. When the new rooms were added, the flooring was matched. Mark is a bit wistful when reminiscing about Mililani, where they lived for 10 years. "We had a great house, big back yard, fully equipped with barbecue." But when Connor was accepted into the University Lab School in Manoa, and they had intentions for Kyle to attend a town school, "we had to think about the quality of life; I didn't want to spend most of our time driving," said Sarah. "We knew this house needed a lot of work when we were considering buying it, but it was what we could afford and we were lucky we bought it when we did." But, said Mark, "When we were actually in it, the boys said, 'I can't believe we have to live here!'" A limited budget meant no alternate living quarters during the renovation. The boys shared one bedroom, the kitchen was kept functional and their living room space was only half livable as they tried to conduct their day-to-day routines stumbling around the chaos of half-unpacked boxes and construction dust. Almost everything in the Wakayama home was handmade or was a gift from friends. 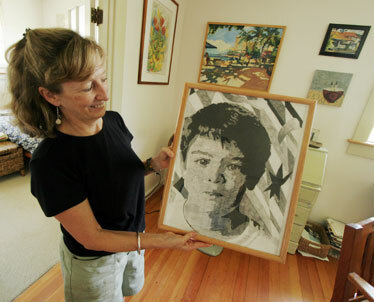 Above, Sarah Wakayama shows a self-portrait her son Connor made. Sarah, the creative force behind the family, according to Mark, did most of the house painting, something she really didn't foresee. But working nights most of the time, she'd be at home as hammers pounded and saws were abuzz, and always had an opinion about the construction that she didn't hesitate to share with the workers. To stay out of the way, she said, she took roller to the wall and started painting -- sometimes several times over. In different colors. To that, Kyle nodded and laughed, "One time we helped her paint one wall purple, and our dad didn't even notice. "It was funny," adds Connor. Mark shrugs and smiles. "It's true. I'm so used to Sarah changing the colors. The boys had to point it out to me." 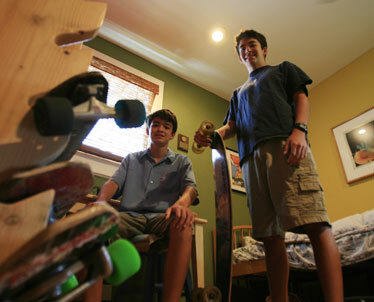 Kyle and Connor have creative license over their rooms, and parents don't interfere. "Right now Kyle has a Rasta theme going on with each wall painted a different color, and Connor's room is blue," Sarah said, and each boy is in charge of his own painting. The boys have always liked to be busy with projects, she added, finally admitting that yes, perhaps the fact that she was an art major could have rubbed off on them. Nevertheless, "it's good for kids to work on something and finish it. It makes them feel good about themselves and see that they can accomplish things." Little by little, the home has taken shape. "It's just a regular house and we're just a normal family," said Sarah, with a Zen-like knowing in her voice that seeing the wonder in the mundane is part of what colors life. And on this warm day, the afternoon sun casts a soft glow through the windows, onto walls dotted with paintings and Connor's self-portrait placed in front of a re-purposed mirror inspired by a friend. The overall ambience is definitely Hawaiiana, not kitschy or trite, but welcoming. "It's our palette," she said. 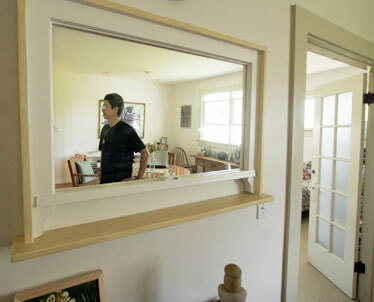 Mark Wakayama is reflected in a mirror made from one of the window frames that the Wakayamas removed during their home renovation. The door at right was once the front door, but Sarah turned it into a bedroom door and replaced the glass with shoji paper to give them privacy but still have light come through.